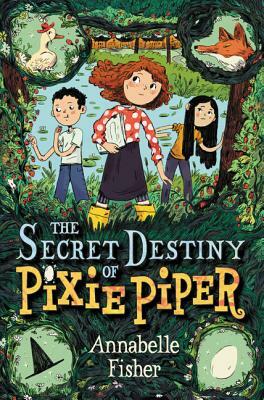 Pixie Piper, an ordinary fifth grader, discovers she is a direct descendant of Mother Goose—and she has the magical ability and poetry power to prove it! A lively and funny twist on a classic character for fans of the Clementine books, Wendy Mass, and Lisa Graff. This is the first of two books about Pixie Piper, and it features black-and-white spot art throughout. Fifth grader Pixie Piper has always known that she was a little different. She has a wild mop of hair that won’t stay put, her best friend is a boy, and to top it all off, she’s constantly coming up with rhymes and poems that just seem to pop out of her. Then, when Pixie thinks it can’t get any worse, she finds out that she actually is different—she’s a descendant of Mother Goose! This surprising and clever novel features family, friendship, poetry, a toilet museum, and just the right amount of magic, as well as a goose, a fox, and a beautiful golden retriever puppy. Rich, multigenerational characters and the real and powerful portrayal of grade-school friendships, with all their ups and downs, distinguish this terrific elementary school story that will appeal to fans of Judy Moody, Clementine, and novels by Wendy Mass and Lisa Graff.